Training Tracks Canine Learning Center is proud to have some of the best dog trainers in the Cincinnati and Oxford area. Check out their bios below. Jeff is a Certified Dog Behavior Consultant who specializes in aggression, separation anxiety, and behavior issues in shelter and rescue dogs. He has played a leading role in setting standards for the dog training industry. He is a past president of the world’s largest association for animal behavior professionals, the Association of Professional Dog Trainers. He also served on the certification review committee of the International Association of Animal Behavior Consultants. You can read Jeff’s work at Dr. Ian Dunbar’s website Dog Star Daily. He has also been published in the Chronicle of the Dog and profiled in the St. Lous Post Dispatch. Jeff has lectured to local veterinary associations and a variety of animal welfare organizations and has been featured on WMUB ‘s free advice program. 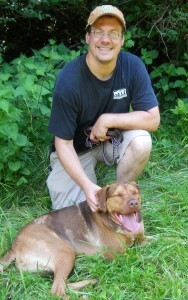 Jeff’s volunteer work with shelter dogs led him to a career in animal behavior. 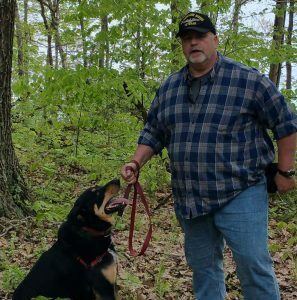 After years of volunteering, fostering shy dogs, and studying animal behavior as a hobby, he began teaching classes with an AKC obedience club in 1996. In 1998, he started his own business in St. Louis, MO specializing in behavior consultations for shy and aggressive dogs as well as consulting for animal shelters on issues like behavioral enrichment programs, behavior help lines, behavior assessments, obedience class curriculum, and development of volunteer and staff training programs. In 2004, he moved to Ohio to join Training Tracks and (more importantly) marry Mel. Jeff does dog behavior consulting throughout Cincinnati, and does most of our in-home dog training in Hyde Park, Mt. Lookout, Indian Hill, Oakley, Mt. Adams, Clifton, and downtown Cincinnati. 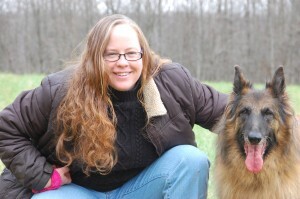 Mel is a Certified Dog Behavior Consultant and Certified Professional Dog Trainer who started Training Tracks in 1998. She has travelled the country studying with the world’s best dog trainers. She runs our board and train program and also specializes in working with fear, dog aggression. She remains most passionate about leveraging the knowledge gained working these difficult cases to develop simple practical solutions to families’ everyday dog behavior problems. Mel has played a leading role in the professionalization of dog training. She served for 9 years on the Board of Directors for the world’s largest association of animal behavior professionals, the Association of Pet Dog Trainers. Her writing has been published in The Chronicle of the Dog and the book “The APDT’s Top Tips from Top Trainers.” She was featured in an episode of Dr. Ian Dunbar’s online TV series “America’s Dog Trainer” and on WMUB’s free advice program, and is a recurring guest on WVXU’s Cincinnati Edition. She also teaches continuing education courses for other animal behavior professionals through Raising Canine. Locally, Mel served as the Vice President of the Oxford Dog Owners’ Group (OXDOG) and has volunteered her time and expertise for the Animal Adoption Foundation, the Animal Friends Humane Society, and a variety of private rescue groups. Mel teaches our dog obedience training classes in Oxford as well as in-home dog training in Oxford, Hamilton, Eaton, and Richmond, IN. She also oversees our dog board and train program. Ariel teaches classes at our West Chester facility and does in-home training in West Chester, Mason, Liberty Township, Middletown and Trenton. She is a graduate of the CATCH Canine Trainers Academy. She worked as a dog sitter and walker for several years before joining the Training Tracks team. When she was growing up, Ariel’s family often joked that she was either going to be an artist or a vet. Her childhood hero was Steve Irwin, deeply ingraining a passion for wildlife conservation to compliment her love of dogs. When time for college came around, it looked like art would win out over animals for Ariel’s career. 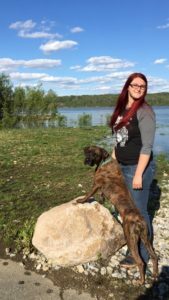 She completed an Associate in Arts at Sinclair Community College in 2013, but ultimately decided that she needed to work with animals. 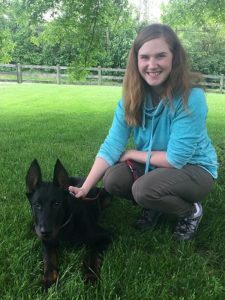 Her work as a pet sitter and dog walker cemented her passion for working with families and their dogs to give them the best lives possible, and she pursued a career as a trainer. Lindsay works with our board and train dogs as well as teaching classes and doing lessons at our Oxford facility. She came to Training Tracks in 2016 to complete the internship portion of her training through Animal Behavior College. We always offer interns the opportunity to shadow us as much as they like, and boy did Lindsay take advantage of it. She was here nearly every day and was obviously a natural born trainer. We were so impressed that we offered her a job before she even finished her education program, and she jumped right in. Lindsay has been obsessed with animals ever since she was a little girl. She went from rescuing butterflies as a very young child, to the stray animals in her neighborhood in grade school, to helping rehabilitate wildlife at 16. She knew that she wanted to make a difference with animals, but it took a while to pinpoint her real passion. She explored becoming a veterinarian, then a vet tech. 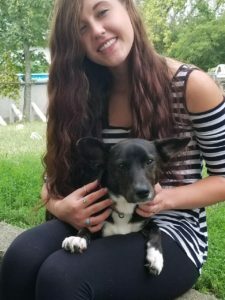 Training began to interest her as she explored her career options, but she became obsessed with training and animal behavior when she adopted Sammie, a rescue dog with some behavioral issues. Giving Sammie a chance when nobody else would and working to help him overcome his fears made it clear that she wanted a career making a difference in the lives of families and their pets. Heather teaches classes at our West Chester facility and does in-home training in West Chester, Mason, Loveland, Maineville, and Liberty Township. She is a Karen Pryor Certified Training Partner with a wealth of experience training a variety of species. 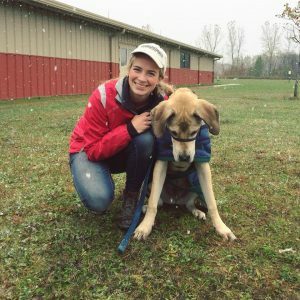 She started training animals in 2008 while she was at Miami University. 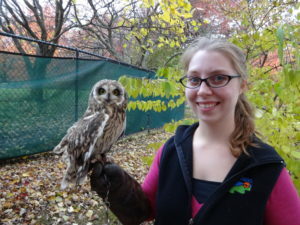 She did a summer internship with the FlightZone Bird Show at the National Aviary in Pittsburgh and her drive to learn more about animal behavior began. She has had the privilege to work with parrots in South Africa, foxes and bobcats in California, and birds of prey in northeast Ohio. She also spent a wonderful summer working with the Cheetah Encounter Show at the Cincinnati Zoo. A dog owner from birth, Heather decided to take her training knowledge and apply it to our canine companions. She taught group training classes at Petco for a year before joining Training Tracks and quickly developed a real passion for deepening the relationship between animals and humans through clear communication based on mutual trust and respect. Hannah is our official Senior Executive Puppy Snuggler for our board and train dogs. She works as an animal care technician helping with everything from feeding to walks to cleaning. Her most important duty is helping to make sure that all the dogs get one-on-one attention and play like they would at home. Hannah completed the veterinary science program at Butler Tech. She worked as a veterinary technician for 2.5 years before joining Training Tracks. and it shows in her knack for teaching dogs to happily accept grooming and handling. Like most of our employees, Hannah started as a volunteer assisting in classes and with board and train dogs. Her deep passion for dogs shone through right away, both to us and the dogs, so we offered her a job. Emily works as animal care technician assisting in care and training for our board and train dogs. Like most of our employees, she started out as a volunteer after taking puppy class with her Great Dane mix, Gatsby. She will graduate from Miami University this May with degrees in Zoology and Pre-Medical studies. She hopes to attend veterinary school in the fall. Mike was our very first employee at Training Tracks. Like most, he started as a volunteer helping out with classes. He’s wonderful with dogs and volunteers with local rescue group. When we needed part-time help caring for board and train dogs, he was a natural choice. He does a little bit of everything for us: training, animal care, fixing whatever breaks, or whatever needs to be done. Mike is a U.S. Naval Veteran and plans to retire from a career at the Richmond State hospital in late 2018. Once he retires, he plans to attend a dog training academy (where we have no doubt that he’ll be at the head of his class) and then to become a certified trainer and member of our training staff. We can’t wait!